Many adults are overweight or obese. That means many of us are eating more than we need, and should eat less. And it's not just food: some drinks can also be high in calories. 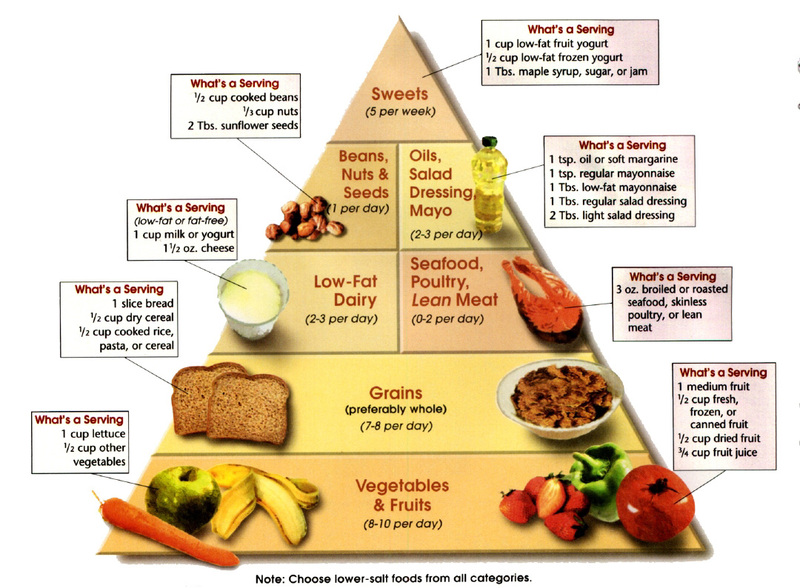 The following food pyramid taken from the DASH approach will give a good idea of the amounts and types of foods recommended to build a healthy and nutritious diet. Combining this with keeping your pH balance in mind will give the best approach to a lasting healthy diet. Remember, the recommendations are of a general nature and may not fit all. For example you may have allergies to certain food groups, finance can be a factor etc. Notice what from the recommendations you can eat more of and those, e.g. sweetened products, you can eat less of. Most adults need to eat and drink fewer calories in order to lose excess fat, even if they already eat a balanced diet. Try to choose a variety of different foods from the seven main food groups. Most people in the UK eat and drink too many calories, too much fat, sugar and salt, and not enough fruit, vegetables, oily fish and fibre. It's important to have some fat in your diet, but you don't need to eat any foods from the "foods and drinks high in fat and/or sugar i.e sweets" group as part of a healthy diet.